Hossam Ramzy was born in Cairo, Egypt. 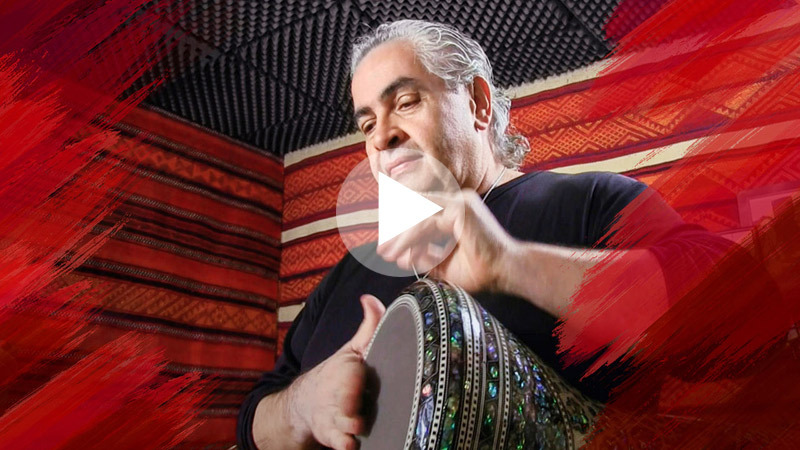 His musical career began early when at the age of three he was given his first drum, an Egyptian Tabla…..
Hossam’s passion and huge talent for percussion was noted by his family, many of whom were themselves involved in the arts. Hossam was encouraged to master his craft and studied under leading Cairo music teachers. 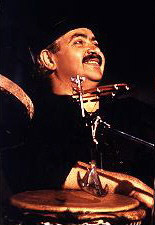 A move to Saudi Arabia led him to join with many Bedouin tribes which gave the young Hossam a rich insight into the cultural origins of Middle Eastern music and became the inspiration for many of his later rhythmic directions. In the mid-1970’s Hossam came to England, and enjoyed great success as a Jazz drummer working with many respected Jazz musicians like Andy Sheperd and Geoff Williams. But as he began looking for new dimensions of percussive sounds, he found himself turning full circle back to his first love, the Egyptian Drums, and the thrilling dance rhythms of the Middle East. Hossam then incorporated all his rhythmic experience into creating a new sound that is heard on hundreds of the world leading albums recorded today. The club dance scene of 2001 was taken by a storm with Hossam’s No# 1 hit EDONY that has topped the dance charts worldwide. The distinctive sound of his Arabian & North African string arrangements, his percussion and exciting rhythms on his albums caught the imagination of Peter Gabriel and Hossam was invited to perform on PASSION and later US, and has just completed the working on Peter’s new unreleased album. Hossam has gone on to work with many top musicians including Joan Armatrading & Mary Wilson. Yesim Salkim, Celick Erici, Cheb Khaled, Tarkan, Rachid Taha, Faudel, The Gypsy Kings and the list just goes on. In 1994 Robert Plant and Jimmy Page (ex-Led Zeppelin) invited Hossam to bring together a band of Arabian musicians and work on their reunion album ‘No Quarter – Unledded’ for which he was rewarded GOLD then PLATINUM discs. This led to Hossam joining Page & Plant on their historic reunion 1995/96 world tour. In November 2001 at the 25th Anniversary of the ARC Music record company, with whom Hossam has released 31 Albums in his own name for the Egyptian dance, he was awarded a PLATINUM disc for being their top selling artist, over 200,000 record sales. Hossam built his own state of the art recording environment DRUMZY STUDIO, in which he has the latest in recording technology mixed in with old; and unique sounds of the best names in recording equipment. With all this available to his fingertips, he can now create many new sounds of the old traditional grooves and Arabian & North African Samples & Loops of which he has no less than 80,000, all in perfect BPM, and ready to use.